The Car Guy's are a family affair, 3 generations to be exact. Ed and Cheryl Luidhardt wouldn't go any place else to buy their cars and that has been the case for decades. However in February, Cheryl brought in husband Ed for a 2007 Ford Explorer, a couple of days before, Cheryl's daughter Jennifer Hickman, bought a 2017 Dodge Grand Caravan, and within two days, grandson Zachary Hickman bought a 2012 Ford Focus. 3 cars, 4 days, same family. It was Zach's second car, Jennifer's 3rd and can't remember how many for Cheryl and Ed. It's owner loyalty like this that has made The Car Guy's The place to buy. Come see why our customers come back again and again. Isn't about time you became a Car Guy? 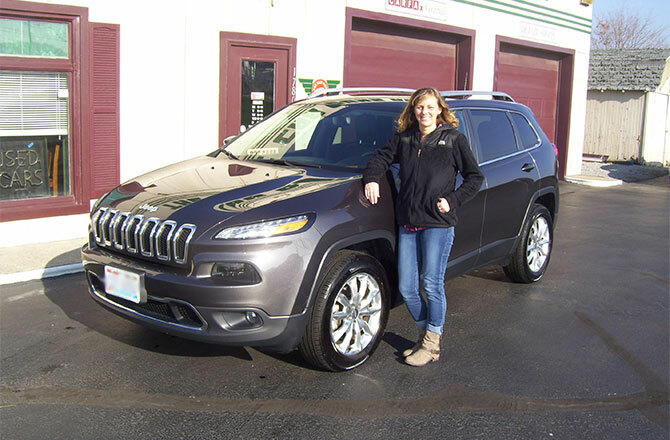 The Car Guys have sold and delivered many 2016 and 2017 vehicles this year like this smart, good looking, well built 2016 Jeep Cherokee Limited to this smart, good looking, well built young lady. Oh, did I mention her name is Melisha Davis. She wouldn't buy her cars from anyone else. Pictured is Hank Davis, Car Guys co-owner, turning over the keys to this 1958 Edsel Corsair to Alan Leonard of Pickford, Michigan. Alan drove 16 hours round-trip to pick up his new Big E. Thanks, Alan, from the Car Guys! 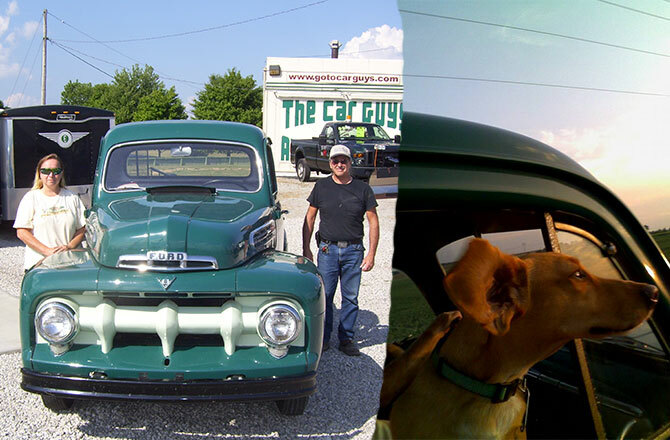 Greg Kuhn and Candi Coleman, of Bucyrus, didn't let this gorgeous 1951 Ford F1 get away. Candi said "Cool cruiser, love the style and enjoying the 51, thanks Hank and Mike!" 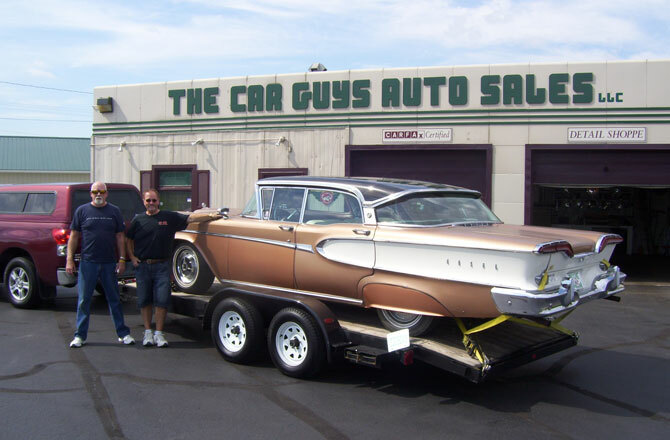 Chuck Miller of Bucyrus just took delivery of his second vintage TBird from The Car Guys. His favorite thing about the car is the color glacier blue. Thanks, Chuck! The first vintage car delivered to it's new owner from Hanks Garage is this '31 Ford Roadster and it's owner Bob Erwin. Bob is now tooling around Bucyrus in his new hot rod. If anyone sees Mary, "mums the word." Terry and Kathy Gernert just traded in the 2005 Chrysler Town and Country they purchased from us in 2007. At trade-in time, the van had a whopping 199,774 miles on its odometer. The Gernerts keep up on their maintenance, which is the key to longevity of any automobile, and of course they bought it from the Car Guys, and just purchased another. Kathy and Terry, we look forward to seeing you in 9 years for your next auto! How long did your last car last you??? 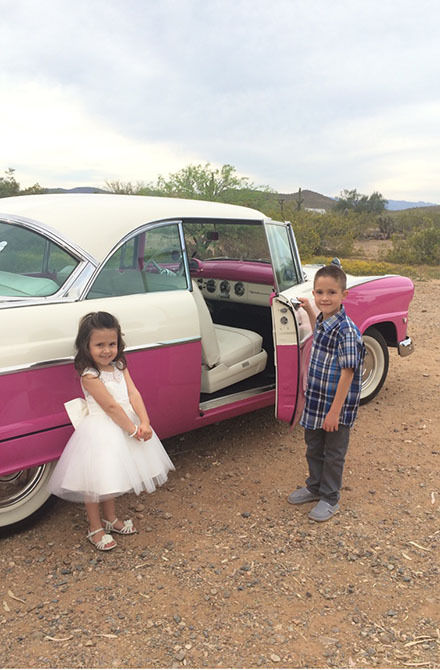 Tyler and Mia Cipriano of Phoenix Arizona are the proud new owners of this fantastic 55 Ford Fairlane Victoria they purchased from the Car Guys. Okay, their dad helped them with the purchase. 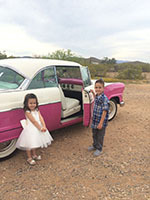 At their first car show, the Cipriano's won People's Choice out of hundreds of cars. It speaks volumes for the quality of the cars we sell, and even with shipping the Ciprianos got a great car at a great price. Joey can't believe how nice his classic is! Pastor Bill and Doris Strader were the Car Guys' 5th sale back on December 7, 2005. Now 346,000 miles and more than 10 years later, Pastor Bill says it's the best car he ever owned. This is great testimonial to good maintenance and a quality car. How long and how many miles did your last car serve you? “On Thanksgiving morning, I took delivery on the 1985 Oldsmobile Cutlass I purchased from you.